With the C2K League playoffs coming up, our commissioner, PSN alabamarob, made an official change in league play. Specifically, the change he made was to not allow a player to pause during the game and make any changes. Once the game starts, the only changes that can be made are the ones allowed on the fly with the d-pad or that are available in the timeout screen. This got me thinking that it might be good to talk about exactly to do during a timeout to make the most of it. The best approach I think is to use the menu that pops up during a timeout as a checklist to remind you of what steps to take and to take them in that order. 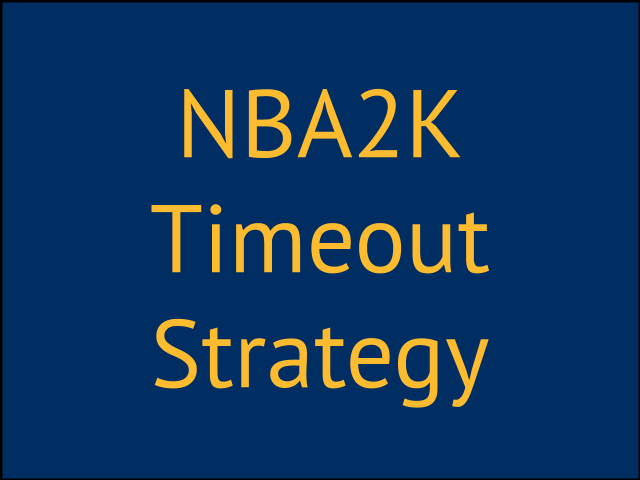 As far as when to call your timeouts, check out my post about how to use your timeouts in NBA2K. Here are the options that happen and some things to think about as you choose each one. Substitutions How you approach substitutions will depend on whether you are subbing in players manually or if you are using auto subs. The first thing I look at in the substitution section is how tired my players are. If they are getting tired, then I sub them out. Typically, my bigs get tired faster than my guards and so my biggest concern is keeping them fresh or otherwise they might get killed on the glass. This is also a good time to think about what you need on the floor and to put the right personnel out their to accomplish that. A good example would be subbing your best free throw shooters on the floor when you know you'll be fouled at the end of a game. You can also sub on the fly if you can think and act fast enough. TIP: At the beginning of the game, set your situational lineups to how you would use them to sub quicker on the fly. Points of Emphasis In the points of emphasis section, you'll have access to both the offensive and defensive POEs. If things are working good, you might decide to stand pat with your settings. But let's say you notice your opponent is constantly pounding the ball inside and scoring easily because you've been limiting perimeter shots. During a timeout, that's the time to make a switch to protect paint in that situation. A change in POE's can also be made on the fly. BUG: Sometimes, POE changes don't stick after the first time you change them in a timeout. It's a good idea to re-check them on the fly once you've returned to action and change it again then if you need to. Defensive Matchups I make changes here defensively to put better defenders against the players hurting me. This is especially useful if you have a lockdown defender and you want to switch your lockdown guy onto their best player. Once last year, when I was playing our Bulls owner, late in the game, I adjusted my matchup of Paul George from guarding the small forward to Derrick Rose to help stop him. A defensive matchup change is not allowed on the fly. Defensive Settings The primary purpose of our commish's new guidelines on when to allow changes only during timeouts was probably specifically in this area. A guy would see he needed to make a change in defensive strategy and pause the game to immediately address that concern but he wouldn't have to utilize a timeout. And, instead of being limited to 20 seconds or one minute, could take up to his allotted time to dink around in the settings for much longer. This took away from the realism of the game. Offensive and Defensive Scouting Reports In a user vs user game, you can get a look at the tendencies of the player you are playing and combined with your knowledge of what is happening in the game, game plan accordingly. This option is not available in user vs CPU games. That's a summary of what to do and consider during a timeout. Keep in mind that you can make subs and adjust POE's on the fly while playing. The best time to do this would be during a free throw attempt and so what our commish has also requested is that opposing players not speed through the free throw routines. This would allow the time to make changes like that. But as far as the other changes, to create more realism in the game and to prevent users from adjusting other gameplay settings from manual to auto, we no longer allow any changes except for what you can do on the fly or in a timeout. What are some things you think about during a timeout? In our league, we have some pretty good players. I'd consider them elite hall of fame players. We've been discussing ways to make the game more realistic and one of those ideas was to learn how to play the game at the highest level without any cpu assistance or feedback from the game. If we do that, then one important component would be how to learn how to shoot without the use of a shot meter or any shot feedback. To do that, what you need to know is that there are three basic results to a shot in 2K. You can shoot it early, right on time or late. Remember an early or late release can still go in, but without the shot meter or shot feedback turned on, how can you tell how you did if it doesn't go in? Early shot release A shot you release to early will go long. Perfect shot release A shot you get the release perfect on will go in. Late shot release A shot you release late will come up short. So rather than look at the meter or the feedback to see how you did, you are going to watch the ball and see what happens to it. Then you'll adjust. The best approach to learn is to go into freestyle practice mode and start shooting. I always use the same camera angle in practice that I do in game. I set up the difficulty level to hall of fame sim and then turn off the shot meter and shot feedback. Then I start shooting. 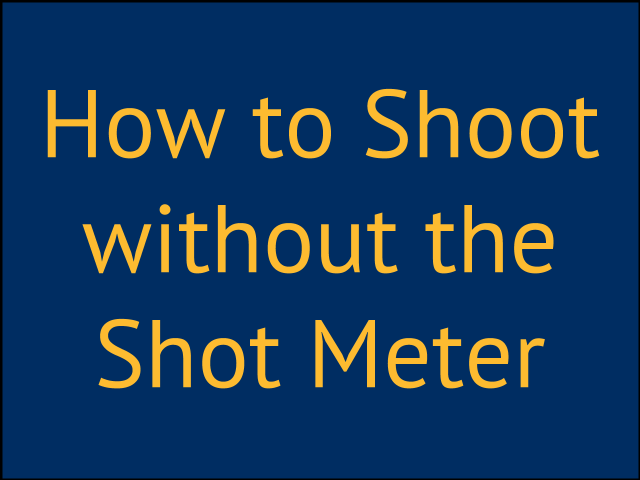 Obviously, you still have to pay attention to your shooter's motion but once you've released the ball, you'll watch what happens to the ball rather than look at a meter for feedback. I've struggled all year getting releases down. Part of the problem is the Pacers don't have elite shooters and 2K tightened up shooting so much that it was pretty hard to get green releases until patch 4 this year. A tip that helped me was to watch the elbow of the shooter and when it should go forward, that's when you release. Anyway, I hope that this teaches you how to shoot without the meter and without shot feedback turned on. I actually think it's more fun to learn how you did from the ball instead of from the game. Let me know how you do if you go without feedback. Here's a video I did to walk you through it. I was thinking today that the only full season I've ever played in NBA2K was with the Los Angeles Lakers back when I first started playing in 2K11. It's kind of ironic that I have used the Indiana Pacers so much in 2K versus users but I've never played a full season with them. I've also never played a full season versus the HOF CPU on 12 minute quarters. The Lakers season I did was on 5 minute quarters, pro difficulty and default sliders. For a long time what I've wanted to do was play the season along with the real life schedule but I've never done that either. I'm not sure why. I think it's partly because I have to learn the game and I spend a lot of time playing users and I want to use the most current roster available. Recently, I started a HOF season and played about 20 games. I was struggling and I figured that if I wanted to do well in my season, I'm going to have prepare more for each game and treat it like a real season rather than just suit up and play without any game planning. What I thought I would do then is start a new MyLeague season file and let you see behind the scenes of what I'm thinking and doing as I work my through it. Hall of fame is pretty challenging for me this year especially with my squad. In order to do halfway decent, I'm really going to have to apply myself and prepare for each and every game. While I'm doing it, I thought I'd take on some new challenges as well and these are things I don't think I've seen anyone work on that I'm aware of. Here are the details of how I'm going to run my season. Real life starters and rotations Each game I play in MyLeague, I'll only use the starters and players that Frank Vogel used in the real life game that was actually played. I'll be starting out the season without Paul George, George Hill, David West and CJ Watson. I'll start the same guys and set up the rotations to get the same players on the floor that he did for that game. To make sure players play, I'm going to run with auto subs in the settings. My lineup management will be set to manual. Post trade deadline rosters For all of the CPU teams, they'll have their full post trade deadline roster available. I gave some thought to playing the actual team the Pacers played in real life. Quite honestly, though, that takes a lot of time and just playing the games themselves will take a lot of time. For me, it was good enough to use the Pacers squad actually used. Hall of fame difficulty, simulation sliders and 12 minute quarters If you know me, I think this goes without saying. It has to be a hall of fame season. In game fatigue will be on. Negotiated contracts, trade logic, injuries and team chemistry will be turned off Since I'll be manually controlling each lineup, I'll need at the very least pick up AJ Price for a few games early in the season. To make that easier, I've turned off negotiated contracts and trade logic so I can move players without teams picking them up. I've turned off injuries because I'll be sitting guys injured anyway. And finally, I've turned off team chemistry so guys don't get mad sitting on the bench because I'm not playing them. I will leave progressive fatigue on. All manual settings and no feedback With the exceptions of auto subs and late game fouling, all other settings will be on manual. I'll be using user timing and calling my own plays. I'm going to turn off all playing aids like play art, the shot meter, shot feedback, rhythm icons, who to guard etc. What I'm trying to do is run the season in a way that gives me the most realistic feel possible. No changes in the playbook or play assignments I want to play the game as 2K shipped it and run with the Pacers default playbook and won't be changing any of the plays. Controller settings I'll be setting both defensive and boxout assist strength to zero and automatic shot contest to manual. My goal for the season it to make the playoffs. It'll certainly be a challenge. I figure I'll have to go at least 500 over the course of the season which won't be an easy task versus the hall of fame CPU. I'll be posting all of my efforts during my C2K Pacers MyLeague Redux on my twitter feed and also here on Coach2K.com. I'll also broadcast each game live on twitch.tv/coach2k and post the full game on my YouTube channel. I hope you follow along. Below is a video where I talk more about my set up. Until then, I'll see you on the court. When NBA2K11 came out, the presentation of the video game on the screen was so true to life, that it actually got me to buy the game. I hadn't played a basketball video game since the Tecmo days. Once I started playing the game, I was hooked. Over the Christmas holiday, I played a full season of 100 games against the CPU on default settings (5 minute quarters, pro difficulty, default sliders) using the Lakers of all teams. After I played that first season, I realized I didn't have to play the CPU all of the time and that I could play other people in a quick match. I eventually started contacting the people I liked playing and also people I met on 2K forums to see if they wanted to play. In order to match up, we had to use the play with friends mode and it was there I really started to think about what settings to play other users on. In many ways, it seemed the game engine was new to existing players and NBA2K11 also brought a lot of new users like me into the series. A lot of the people I originally met back then hadn't given much thought to what settings you played on. What would happen is that you wouldn't play anyone on consistent settings. Some guys played default sliders and some simulation sliders. Some guys played 5 minute quarters, some 8 minutes and then others would play 12 minutes. I remember having many pregame discussions to get people I played to play the same settings that I played everyone else on so I could compare game results. Eventually I got to the point where I just decided that I only wanted to play people who wanted to play on 12 minute quarters, hall of fame difficulty with simulation sliders. To me this was like playing regulation basketball. Playing on the same settings versus all users across the board made sense to me just like playing on 10 foot goal instead of an 8 foot goal did. It's been a while since 2K11. The game, while good, is not new anymore. Guys know how to play when they get the game because it's not much different than the prior year. Sure there are little nuances that make it different here or there, but it basically works the same and consistency from year to year is a good thing. I know personally, I hate having to relearn everything every year. But because the game is not so new anymore, we have a lot of hall of fame level players out there now. And, it got me thinking that as hall of fame users, shouldn't we run games between each other at the highest level and also control all the decisions and actions in the game manually? So beyond the 12 minute, hall of fame difficulty, simulation sliders, what else should we consider? To me that would be all of the manual settings. I think what we should do is dig deeper into the specific settings available to us as players and ask if that setting is a manual setting or not. If it is a manual option then each player on both sides should set it to manual or at least set it to match the other user they are playing. To determine which settings we should look at changing, have a look at the controller settings screen I've included above. You'll see several settings. Some have an on/off option while others have titles that include the words "assist" and "automatic". It seems obvious to me that when hall of fame users play each other they should play defense manually and not have the CPU helping them. 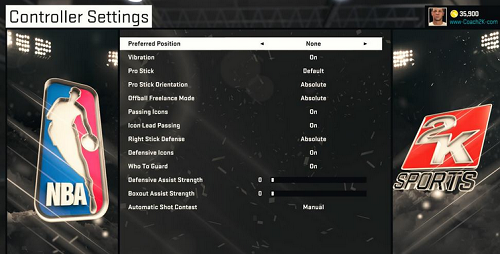 You can see in the settings screen, I've changed defensive and boxout assist strengths to zero and automatic shot contest to manual and in our league, it's now actually mandatory to play on those controller settings. Another setting on that screen is passing icons with an on or off option. You can see I have it set to "on" because it provides information but it doesn't make the pass for me. I still have to do that manually. Because of that I don't consider an on or off option as a manual setting. 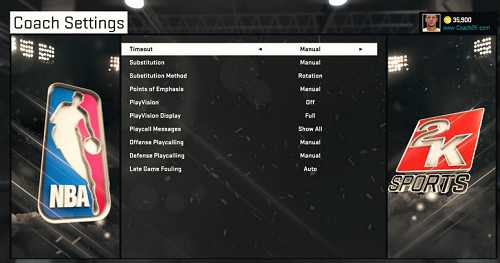 In the coach settings screen, you'll see several settings that have options of manual or auto. In those cases, I think those all affect game play and should all be set to manual between hall of fame level players. The only exception I'd make regarding the manual settings would be the late game fouling. At this point, manually fouling in late game situations seems to penalize the defense because it's so hard to trigger and would recommend both players be allowed to set that to "auto". 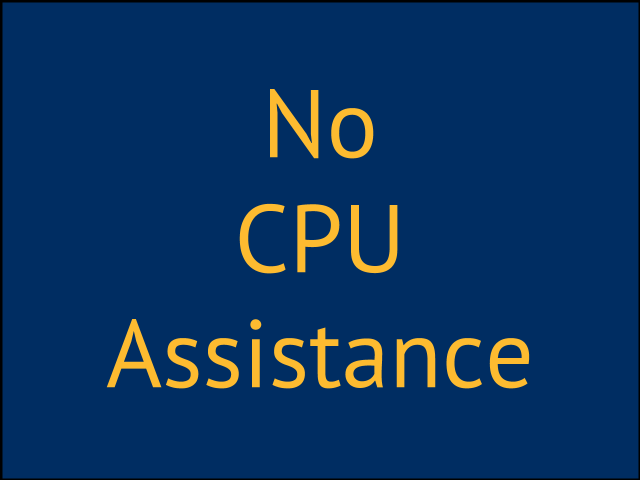 So to clarify, if a setting has an on or off option, I don't consider that assistance and to me any setting with an on or off setting between users is not assistance from the CPU and therefore not a manual setting. An example here is playvision. It has an on and off switch. I don't consider that a manual setting that would affect play between users. Once the settings are set and gameplay begins, all controls available to a player once the game begins should be allowed. In my mind, this would include the use of the 2K smart play option which I believe might be necessary to trigger certain freelance options. As hall of fame players, I think you should consider playing with all feedback off. But while I think that would show a great knowledge of your team, it's kind of high level goal specific to whether a user wants to pursue it but doesn't really affect game play. An example might be to learn to play passing using only using the stick and not icons. Another good example might be play art. If you run plays the game is definitely harder if you turn play art off. Having it off would require a thorough knowledge of your plays and where they initiate. Because I think all players should strive to master the game and to know one specific team that well, of course I think that's a great goal to have. But I don't consider it essential and think it's just one of those things that people can do to make them feel they have elevated their play to another level but is really unimportant in their matchup with another user. Should we raise the bar and expect more from hall of fame level users in head to head play? David West returned to the C2K Pacers lineup tonight. He dominated the offense and put up 42 points in the win. However, Vucevic was much more efficient and went 12-15 to get 26 points of his own along with 14 boards to lead the Magic to a 107-99 win. In a game without Hibbert, Vucevic had his way against Indiana. Protecting the defensive boards continues to be a problem for the C2K Pacers. Three Magic players each had 5 offensive rebounds while Indiana only tallied 5 as a team. This game was won at the free throw line as the Magic outscored the Pacers by 9. While my lineup is still shorthanded, I think part of the problem at this point is still the same and that's my inability to play good defense and run a good offense so I'll continue to work on those two areas. The schedule doesn't ease up as the Cleveland Cavaliers are next up. The Indiana Pacers stuck with the hot shooting HOF Spurs for a half a game of basketball tonight ending the first half in a 53-53 tie. But the second half brought more hot shooting and C2K eventually lost focus and got away from what worked. The top four Spurs shot 29-34 from the floor for the game and combined for 68 points. Rodney Stuckey had 34 for the Pacers and also went 4-5 from deep. Beyond that though, Stuckey had no help. But the Pacers woes were mostly on defense where they kept the Spurs from going crazy from three but couldn't stop anything else. The Pacers were still playing shorthanded tonight because of early season injures and Hibbert was also out of action tonight. At the end of the third, in spite of the hot shooting, Indiana was only down 11. A burst to start the 4th and a rushed offense put the nail in the coffin. The Pacers are now 1-14 on the season. The Orlando Magic are next up on the schedule and travel to Indy for the game and the big news for Indy is that David West returns to action. Here's the complete game versus the HOF Spurs. But the Pacers played hard the rest of the way and managed to make the loss a respectable 17 point defeat that dropped the short handed C2K Pacers to 1-11 on the year. AJ Price was the bright spot in this one as he went 6-7 from the field, 2-3 from three point land, and ended up with 16 points off the bench. Not much learned in this one except that my initial defensive set up was probably not right. While it worked the rest of the game, it didn't work in the first quarter. I probably also chucked too many threes in the first quarter. Chucking too many ill-advised threes is usually always a bad idea. Here's the video of the game in it's entirety. 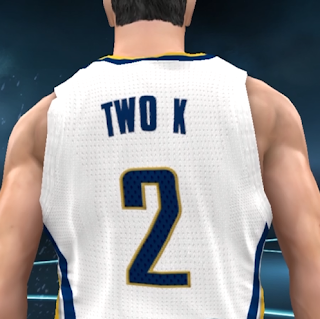 After opening the season 0-11, C2K and his Pacers finally got in the win column. This game was pretty even most of the way until the fourth when Roy Hibbert asserted himself by getting inside and to the free throw line. He finished the game with 25 points, 7 rebounds and a block. Solomon Hill had a really nice game as well. He scored points, went 7-13 from the field including 4-8 from three. He also added 3 steals. Solomon is one of my favorite players on the team so I was happy to see him do well. Not that any game is easy versus the HOF CPU, but this was pretty much under control the whole way and I was determined to get the victory so I went inside. That got Al Jefferson in foul trouble and he fouled out with about 10 minutes to go in the fourth quarter. Here's the complete game footage. My C2K Indiana Pacers opened their MyLeague season by welcoming the HOF CPU Philadelphia 76ers to Banker's Life. The Indiana Pacers won their real life home opener against Philadelphia and I was hopeful to duplicate their efforts but I dropped this one in overtime 102-99. The 2014-2015 season opened with several guys injured in real life. Paul George, David West, George Hill and CJ Watson were all unavailable. Rather than play my NBA2K15 Hall of Fame season with all those guys, I'm going to use the actual lineups that Frank Vogel used and make do just like he did with the personnel available to him at the time. I went back and looked at the game to see who Frank Vogel started and how many minutes he played each real life Pacer. I then went into my MyLeague file and set my rotations to the minutes he played everyone. I then put the game on auto substitutions and then play with whoever gets put on the floor. Once the game starts, how they play along with foul trouble will determine the minutes that player actually plays. I've noticed to that unless I get down huge, the rotations stick to the guys I gave minutes to and that's the main thing I'm after. I don't want to use George Hill if Vogel didn't in the real life game. I have noticed though, that if the game appears out of reach, the CPU coach will clear bench even if it wasn't assigned to play in that game. This game was really out of reach but because it seemed out of reach, George Hill was put in and he nailed a late three and sank two key free throws to send it to the overtime period. Had he not been put in, I doubt that I would've been able to do that. While I want to win every game I play, I really set out to learn more about the team as a whole when I play on that difficulty. I take what I learn from playing the Hall of Fame CPU to apply it to future games versus the CPU and versus users. Normally each year, I focus on one hall of fame CPU opponent to do that, but this year, I am working my way through a season. In this one, Donald Sloan led the Pacers with 35 points but I lost in overtime 102-99. I spent a lot of time running Sloan off pick and rolls and driving him to the basket to either get a layup or to draw contact to get to the line. I learned he can finish well at the rim and he can get to the line. While I got a lot out of Sloan, I'm not going to win many games with him carrying the load and shooting the ball 23 times. So it was good learning experience to see what he could do but that's not going to work long term even though at the moment I lean on putting him in that situation when I need a score. If the paint is locked down, he can get his shot blocked pretty easy. All in all it was a pretty fun game and I was in position to win it which was great. The hall of fame CPU always works hard to get every win at this level and this game was no different and they pulled it out at the end. I thought the key stat in this game was I ended up with zero offensive rebounds. Crazy considering I missed so many shots. Here's the complete game for you to watch.